ionDESK: Yes, You can set the Entry, Target and Stop Loss Order at Once! Yes, You can set the Entry, Target and Stop Loss Order at Once! ionDESK grants traders and investors what they have been wanting for years. We've all needed it and we've all wanted it. That one request is the simple ability to create an order with an entry, target (profit point) and stop loss all at once. Traders know that this approach makes them more discipline and less panicked when entering a trade. With other systems you have to create the buy order, then you can only set a stop or target order. Then if the trade goes against you, you must cancel the target order then create the stop order. Doing all of this while your position is losing value can be frustrating. Professional traders at large firms have the ability to do this. Why shouldn't we? ionDESK makes this possible through the use of the Bracketed Order Form! 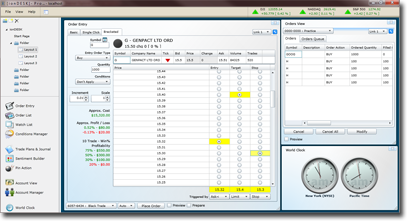 Using our bracketed orders form you will trade professionally with more discipline and accuracy. We've again made it easy to place bracketed orders with entry, target and stop points or any combination for stocks, options and ETFs. Also custom and global conditions may apply to orders. Visit the DEMO Video page to see this feature in action.